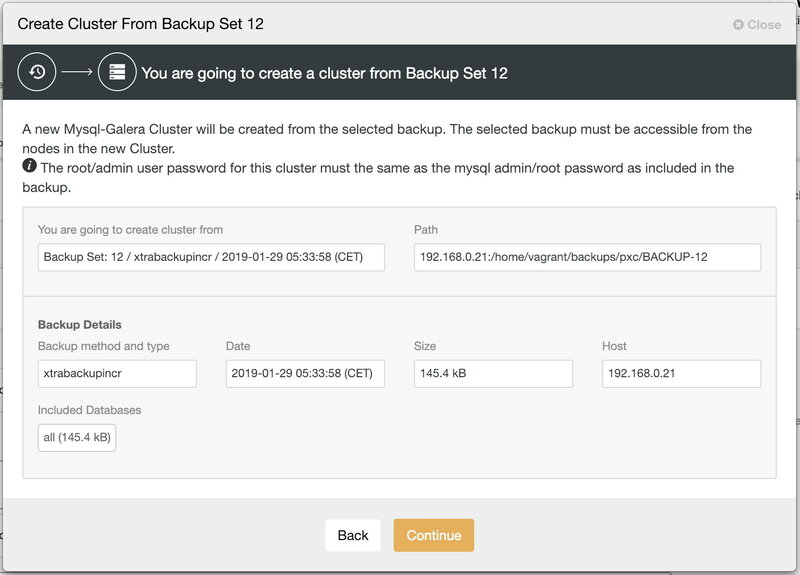 ClusterControl 1.7.1 introduces a new feature called Create Cluster from Backup, which allows you to deploy a new MySQL or Postgres-based cluster and restore data on it from a backup. This blog post shows how this new feature works, and how this type of automation can deliver improvements to your infrastructure operations. Combine the above with the complexity and repetitiveness of database cluster deployment tasks, you can save time and reduce risk in running error-prone procedures. The hardest part from the user's perspective is to pick which backup to restore from. ClusterControl will handle all the heavy lifting behind the scene, and report the end result once finishes. Setup passwordless SSH from the ClusterControl node to the new servers. 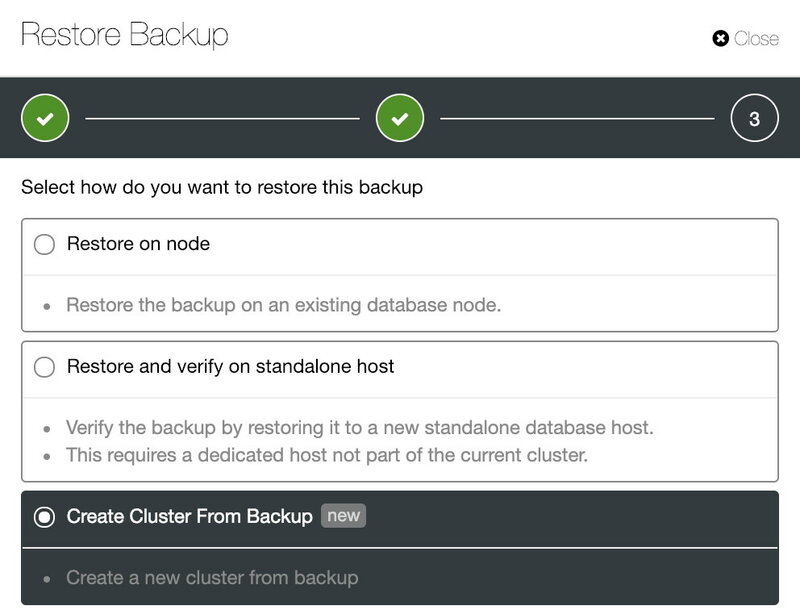 Pick one logical backup from the backup list, or create one under Backups -> Create Backup. 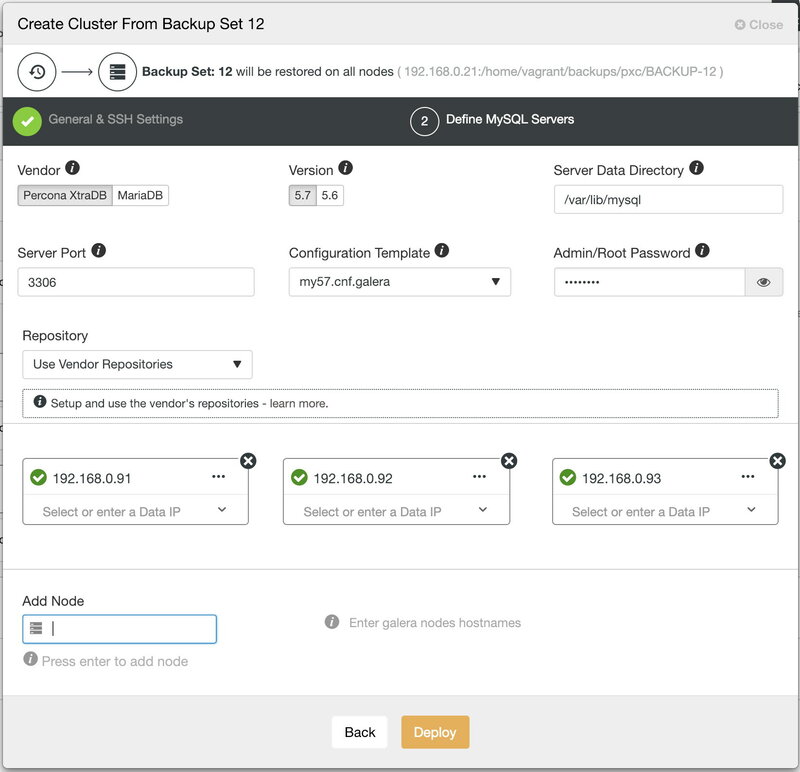 Click Restore -> Create Cluster from Backup and follow the deployment wizard. Install necessary softwares and dependencies on all database nodes. A new database cluster will be listed under ClusterControl cluster dashboard once the job completes. There are a number of things you could benefit from this feature, as explained in the following sections. 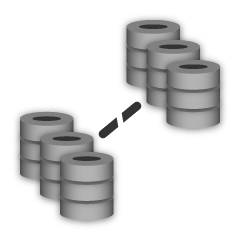 Sometimes, you might be wondering a the new database version would work or perform for your database workload and testing it out is the only way to know. This is where this feature comes in handy. It allows you to perform tests and benchmark on many variables involved that would affect the database stability or performance, for instance, the underlying hardware, software version, vendor and database or application workloads. Having another cluster to compare with actually allows us to measure the improvement and justify a migration. Setup passwordless SSH from ClusterControl node to the new servers. Pick one created logical backup from the backup list. 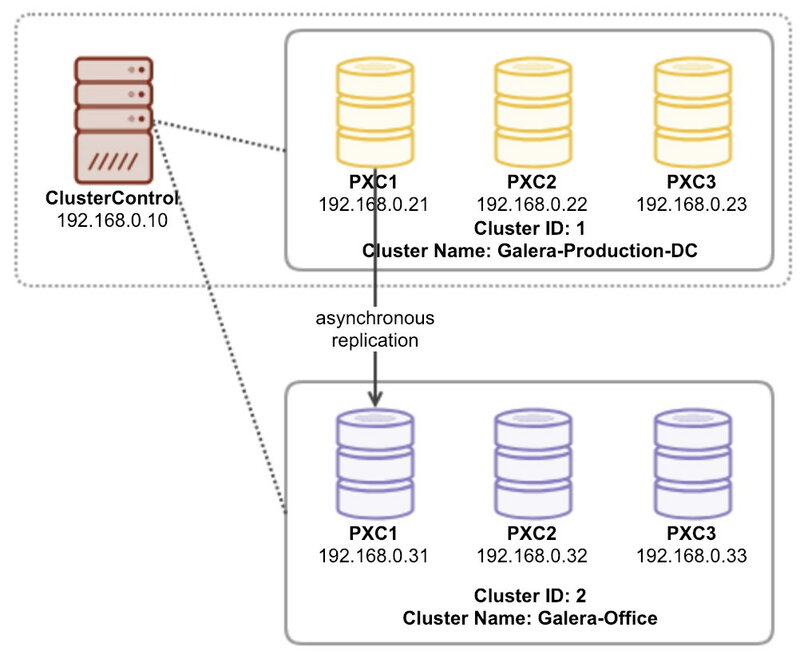 Verify the data restoration on the new cluster. Point your application to the new cluster. One thing to note when using this feature is to use the same admin username and password as what's stored in the backup. Also, the passwordless SSH to all database nodes must be configured beforehand. Otherwise, if you prefer to configure it interactively, just use the web UI interface. Pick one node in the production and enable binary logging (if disabled). 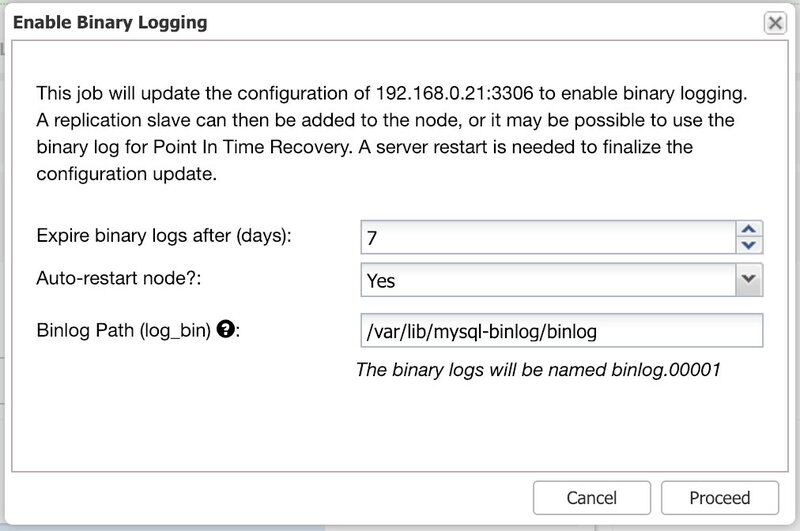 Go to Nodes -> pick a node -> Node Actions -> Enable Binary Logging. Otherwise, you can perform this operation without downtime by using Manage -> Upgrade -> Rolling Restart (or manually restart one node at a time). 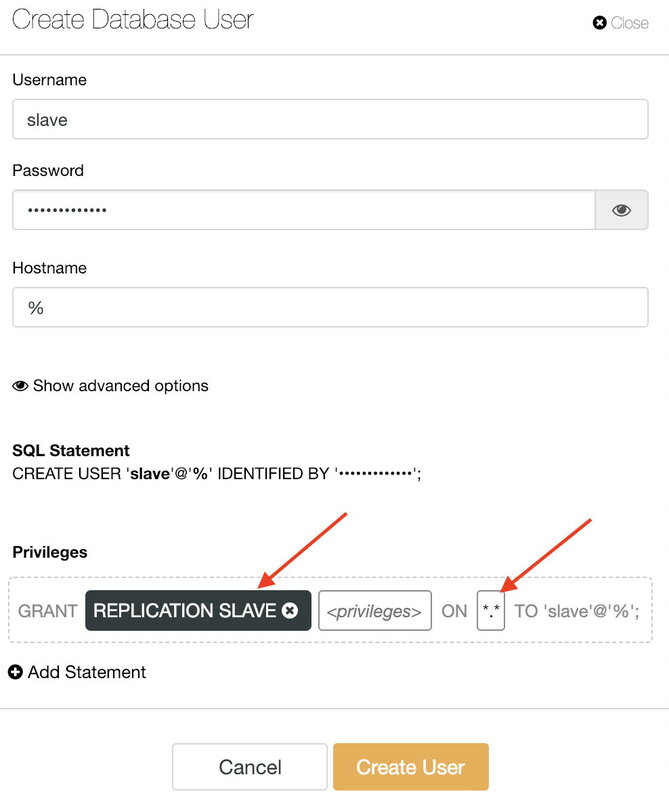 Make sure Slave_IO_Thread and Slave_SQL_thread are reporting 'Yes'. The office's cluster should start to catch up with the master node if it's lagging behind.